Sam writes . . .
HI! My name is Sam. I am in 4th grade. I was wondering if I could interview you for a school research project. my topic is monsters. I can send the questions by email if it is convenient for you. Hi Mr.Preller! These are the interview questions. 1) what is the most common monster? 2) what are common monster traits? 3) why are monsters feared? 4) how are most monsters created? 5) how do your monsters act? 6) how did you create your monsters? Thanks for making the time to do this! 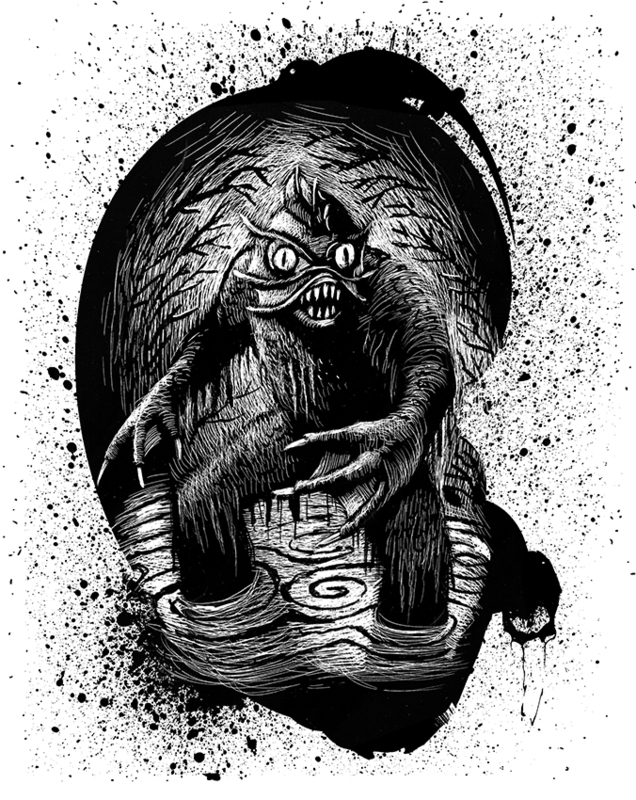 You should know that I don’t know any monsters personally — and I mean, monster-monsters, not monstrous people or events — we all have a little monster inside us, I believe — so I’m not sure I have the exact brand of expertise you seek. For my “Scary Tales” series, for example, I usually make up “monsters” that I imagine might frighten a reader, or frighten me, though I have yet to write a story about a monster-dentist. Talk about scary! I could call it, THE ROOT CANAL! Or, I don’t know, THE BRACES TIGHTEN! Another scary title for a monster story might be, oh, THE CONGRESSMAN! So I guess in that sense monsters can come in all shapes and sizes. Not necessarily swamp monsters or werewolves or zombies. Anyway, that said, let me try to answer your questions, Sam. 1. The most common monster? The one under your bed. 2. Common traits? They like to hide in dark places. 3. Monsters are feared because they are . . . other. Different. Not us. But the reverse can also be true. 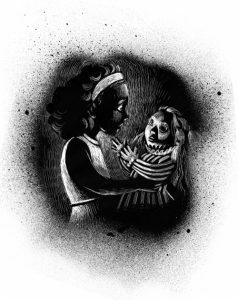 In my book Swamp Monster, the creature from the swamp, the so-called “monster,” simply wants her baby back. An egg has been stolen from her. She’s a loving mother. So I ask you, as I did in the book, who is really the monster in that story? I guess it depends on your point of view. 4. 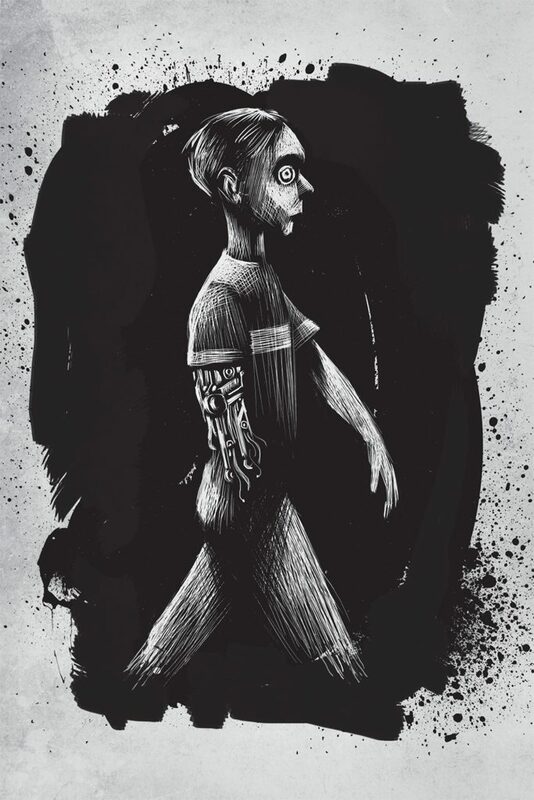 Monsters are created from the dark places in our imaginations. Once they are dreamed up, they are free to go about as they please. There’s no putting the toothpaste back into the tube, so to speak. 5. Like every other character in a book or story, monsters want something. The question is always: What does this character want? 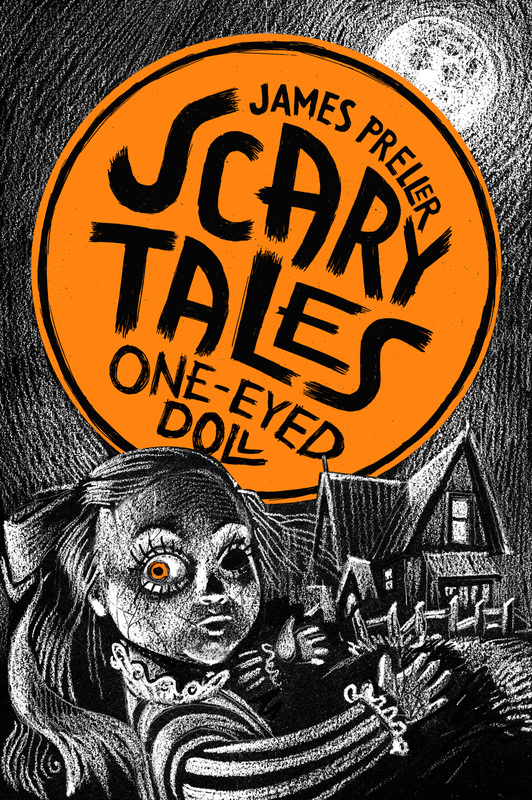 In The One-Eyed Doll, the “monster” — I use quotes here, because I’m not always comfortable labeling these creations as monsters — wants to be a real girl. Not a monstrous desire at all. But of course, in order to get what she desires . . . well, that’s the scary part. The wanting can be a sort of disease, a sickness that allows you to do horrible things. Greed is the kind of disease that can turn ordinary people into monsters. They want what they want. When I think of monstrous people in our world, the common characteristic is a lack of empathy. They don’t care about anyone else but themselves. Selfish, greedy. They don’t care who they hurt as long as they get what they want. Once you begin to think about how someone else might feel . . . once you walk around in someone else’s shoes, see life from their point of view . . . that’s when you lose your ability to be a monster. To me, a monster is almost always deeply egocentric, unable to think of anyone else’s feelings but his/her own. 6. How do I create them? The glib answer is that, as a writer, my job is to make things up. And I do that piece by piece, characteristic by characteristic. 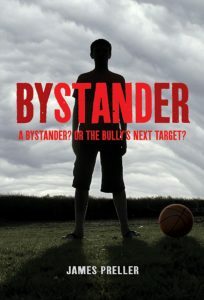 When I wrote a book about bullying, Bystander, the character who was the “monster” in that story — a boy who did monstrous things — I made sure that he was attractive in many respects. A good-looking kid. A smooth talker. Nice smile. That’s what made him especially dangerous. He didn’t appear, at first, as a monster. Quite the opposite. Sometimes the scariest kid in class is four feet tall and wears blonde pigtails and has a terrific smile. And sometimes the monster might be childhood illness, as in my book Six Innings. Or a mother’s cancer in The Courage Test. Not something I made up, but recognized as a actual terror in the real world. But again, let’s get back to traditional monsters, and what the monster wants. In Good Night, Zombie, the monsters are zombies. They aren’t complicated. They just want to eat. Unfortunately, we’re on the menu! I’m curious. What are you going to do with them? For starters, apologies to the artists, Iacopo Bruno (SCARY TALES #3: Good Night, Zombie) and Greg Ruth (A Pirate’s Guide to Recess). The art represented below might make them sick to the heart; I can only guess. The shots below were taken from the books via my iPhone. The quality of the original artwork is in no way reflected here. But as far as I’m concerned, these crude snaps serve the conversation. Also: I’m going with what I’ve got. The art immediately below comes from a spread late in the book, Good Night, Zombie. 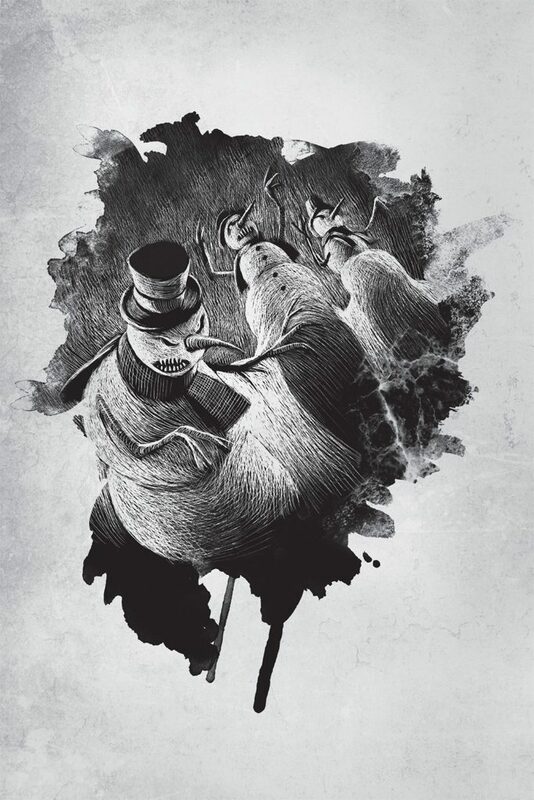 It’s an exciting moment of peril and temporary escape, of dead hands reaching, clawing. I love it. 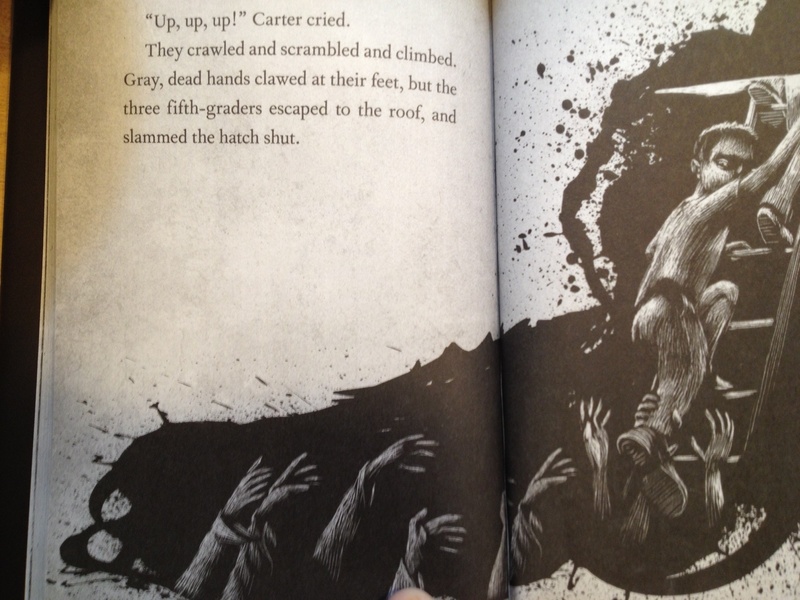 And I’m grateful for the design here, which breaks away from the usual layout of the book, with the art leaking across the gutter, where for a moment the chapter book takes on more of a picture book aesthetic. “Up, up, up!” Carter cried. 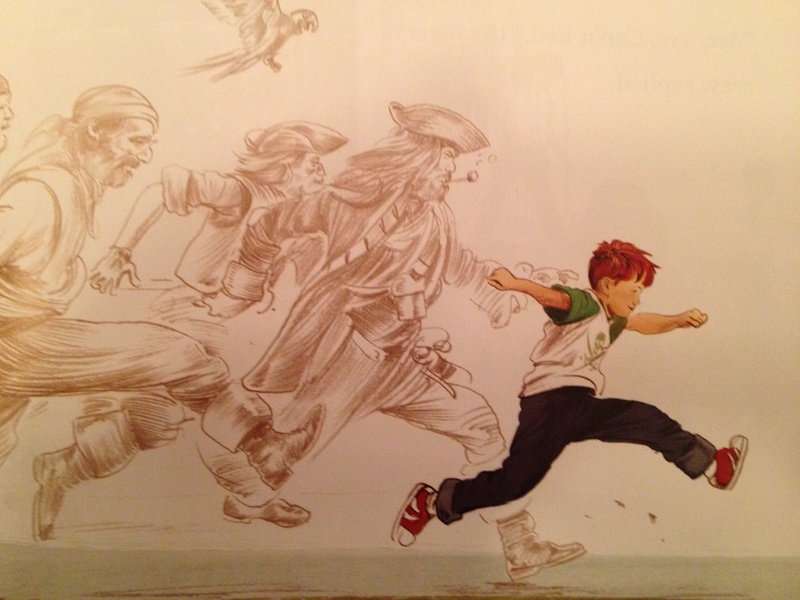 The picture below is a detail of a larger piece of art from my most recent picture book, A Pirate’s Guide to Recess. To me, as an ex-kid who became a published author, the moment depicted here feels like the story of my imaginal life. I was that boy. Dreaming things, imaginary games, battling monsters or tough pitchers, walking the plank or ducking for cover. Bombs exploding, tacklers approaching. Inside my private skull, it was one “Yikes!” moment after another. And when I ran, the life of my imagination trailed after me. Stomping in heavy boots. That’s what I tried to get at with this book — what I hoped to celebrate — and it is a personal thing. The stuff of dreams. It’s amazing that an artist I’ve never met helped bring it vividly to life. 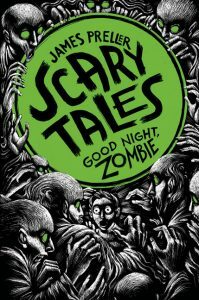 And for the zombies, and all the great art in the Scary Tales books, thank you, Iacopo Bruno. 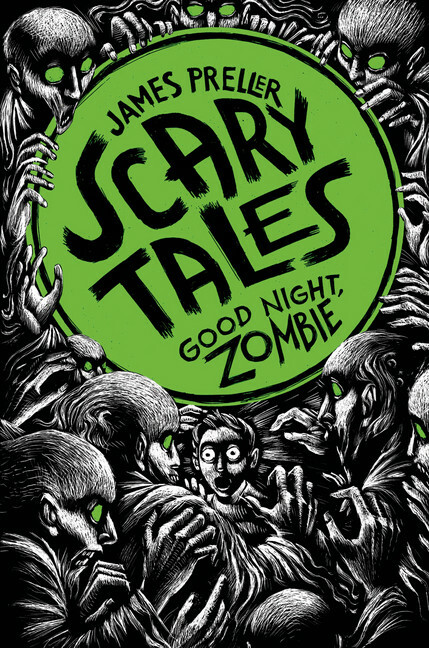 I can’t wait to see what you do with Scary Tales #4: Nightmareland.